​Here’s a fact not many people know: Lane County has more remaining covered bridges than any county west of the Mississippi River. So what could be better than a ride that celebrates several of them — along with some small-town charm, a beautiful lake at the foot of the Cascades, and a smooth, mostly flat rails-to-trails bike path from downtown out past the lake? 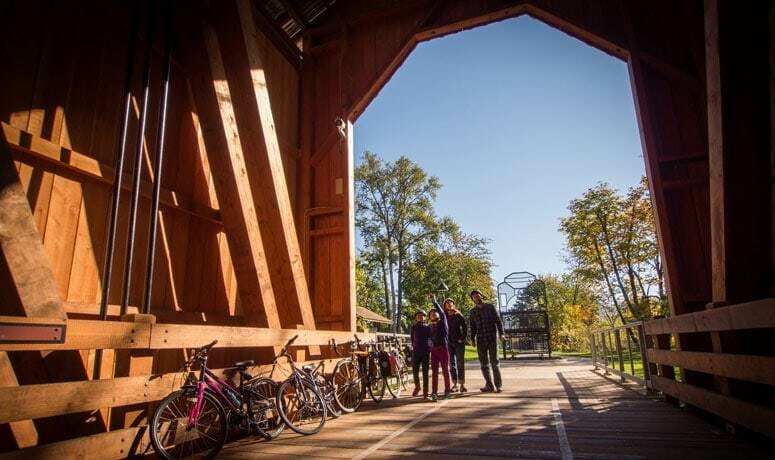 The Covered Bridges Scenic Bikeway follows the Cottage Grove Covered Bridge Tour Route, and it’s appropriate for almost any rider. This is a refreshing, naturally beautiful ride you’re sure to enjoy, and a great chance to check out Cottage Grove, a historic town with a handsome downtown and lots of activities and attractions. 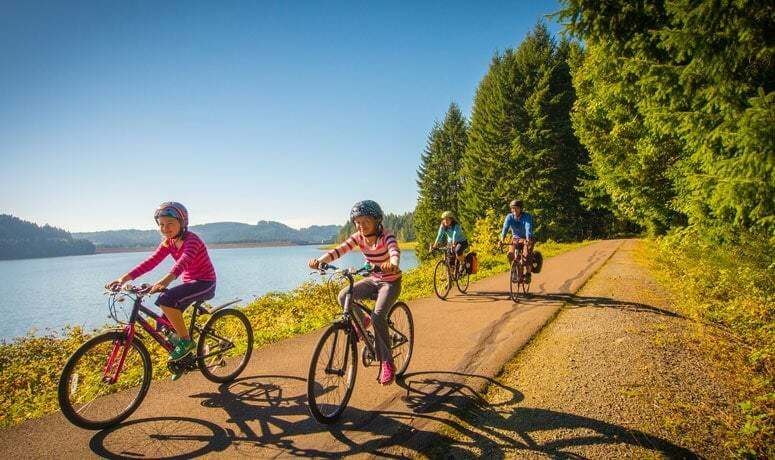 Start in downtown Cottage Grove, with parking areas available at Bohemia Park or the Community Center, and spend the first part of the ride soaking up an authentic sense of Oregon history. Cottage Grove has maintained its sense of the past – this was a gold-mining hub in the 1860s, and its visual charm has led to its being the setting for a string of Hollywood movie favorites, from 1926’s The General to Animal House in 1978 and Stand By Me in 1986. Start with a loop around downtown Cottage Grove, sharing low-speed Main Street with cars as you pedal through the Downtown Commercial Historic District, which is listed in National Register of Historic Places. Before, after – or even during – your ride, enjoy one of the numerous coffee and ice cream spots, restaurants, and shops along Main Street. At the western end of downtown, the Bikeway includes views of two more covered bridges and a swinging footbridge – including the Chambers Bridge, the only covered railroad bridge west of the Mississippi that is also listed on the National Register. 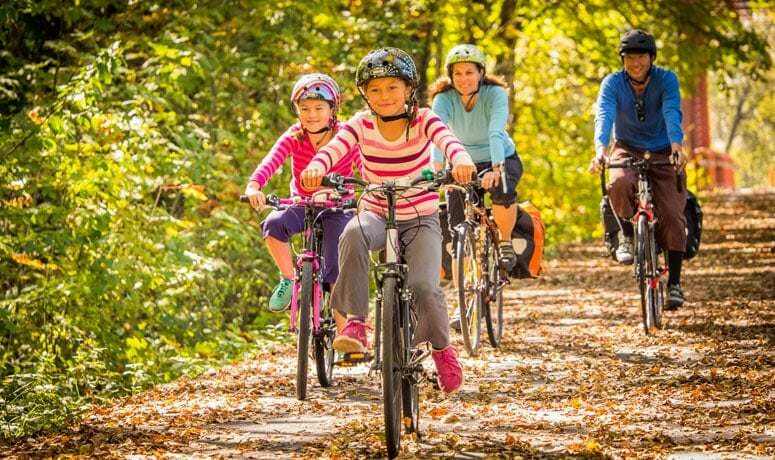 From downtown Cottage Grove, join the 17 miles of the smoothly paved Row River Trail, a bike/ped-only path along the north side of Dorena Lake. (You can also choose to start at the trail’s Mosby Creek Trailhead, which will make your entire ride car-free.) Built on an old railroad bed, the path is gently sloping – and mostly pretty flat. Cross bridges, spin through thick stands of trees and skirt the shore of the large, placid lake. You’ll marvel at how quickly you go from a bustling town to the quiet of the countryside. In some places the terrain opens up, giving you a sense of the valley you’re in – and the imposing, forested foothills of the Cascades looming just to the east. But, of course, the bridges are what this route is named for. You’ll pass three more covered bridges on the trail, all listed on the National Register. Dorena Bridge is a popular wedding site, a scenic backdrop that adds a touch of romance to the experience. Along the way there are four bathroom stops, seven parking areas, and three picnic areas along the trail, so you can pace yourself however you like; we recommend taking your time to stop and explore, or just to bask in the sun as you gaze across the blue waters. Follow the path nearly to its end and you’ll come across a small store in the modest community of Dorena, where you’ll find snacks and refreshments. Past that the path ends with a small loop that catapults you back toward the start. You can do this Scenic Bikeway as an out-and-back on the Row River Trail, which can keep the ride traffic-free both ways – or you can mix it up a little, going out on the path and back on roads. If you take to the road, it’s still a generally low-traffic route, and you’ll see yet another covered bridge. The official Bikeway route follows a path that includes one good climb on Garoutte Road, if you like that sort of thing – but you can also easily bypass the climb by cutting back toward the Row River Trail at the west end of the lake. There are two campgrounds and one bathroom stop along the road route. For more to see and do near this Bikeway, visit Oregon Wine Country and the Cottage Grove Area Chamber of Commerce. Several area parks offer services: Schwarz Park near Dorena Lake has a campground and restroom facilities; Bake Stewart Park and Wilson Creek Park also offer restrooms. 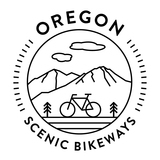 Did you know Oregon has the only Scenic Bikeways program in the nation? This unique program features routes suggested by local proponents, so you know you are getting the best of the best when you ride an Oregon Scenic Bikeway. These routes have been officially reviewed, ridden and adopted and each one provides inspiration for planning a two-wheeled vacation in Oregon.